Elite BMW is proud to offer a complete lineup of brand new BMW cars, sport-activity vehicles, and high-performance machines. Known the world over as the “Ultimate Driving Machine,” BMW models are truly the driving enthusiast’s dream. At Elite BMW, we take the time to understand your needs and your expectations before making every effort to fulfill them. Our dedicated team of professional and courteous sales representatives is as passionate about BMW as you are, and they take great pride in representing one of Germany’s premier automakers. That is why every purchasing experience at Elite BMW is tailored to the client. We want you to have the very best experience here at Elite BMW and every effort is put towards that goal. 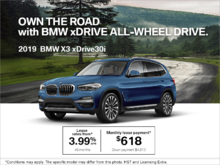 Whether you are in the market for a new BMW 3-Series, a luxurious BMW 5-Series, the rugged yet refined BMW X5, the brand new BMW X4, or something with a little more punch like the BMW M3, Elite BMW will offer you the very best car buying experience, that is our promise. To learn more about the full lineup of new BMW models, contact us today at 1 855 728-4020 or book a test drive online on our website. 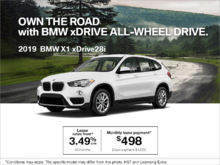 You can also browse our inventory of new BMW vehicles online. If we do not have the model you are looking for, contact us and we will make every effort to find it.